The following are notes on my involvement in Operation Desert Shield/Storm. First, allow me to attempt to describe my military job. I say "attempt" for it has been my experience that most people are unable to understand my duties from my descriptions. The unit to which I belong, the 160th Air Refueling Group, based at Rickenbacker Air National Guard Base, flies KC135-E Stratotankers, which are the air-refueling tankers based on the Boeing 707 airframe. I work in the Combat Crew Communications office and am trained as a Ground Radio Operator. Our office provides the communications training, and the classified communications documents the aircrews need in order to fly their missions. These documents include books of daily-changing callsigns, encode/decode books, authentication-table books, and IFF/SIF codes. The callsign and encode/decode books are, I hope, self-explanatory. The authentication documents are daily changing tables with which radio operators verify that the fellow on the other end of the radio link is truly a "friendly". Authentication codes generally consist of a two-letter "challenge" and a single-letter "reply". The IFF/SIF codes are used to key the aircraft transponders to automatically identify the aircraft. (Many of the new smart weapons automatically read these codes to determine who is NOT the enemy.) In some circumstances our office actually sets up and uses HF radio in field conditions, but for this war, a dedicated communication element was provided for our unit, thus relieving us of this task. The most unpleasant period of the whole war for me was the time between activation and our arrival at Abu Dhabi, as it was fraught with uncertainty and confusion. (The trailer in which I had been living had burned a scant three weeks prior to activation, and my life was still in disarray.) We were given training in the wearing and maintenance of our chemical warfare suits. We were required to re-certify using the M16 rifle, this time to include familiarity with its fully automatic mode. Both the chemical warfare and the small arms instructors were successful in creating fear in us concerning the upcoming war. The flight to Jeddah seemed interminable. The trip took approximately eighteen hours; in addition, we stopped for one-and-a-half hour stop-over at Moron AB, Spain. 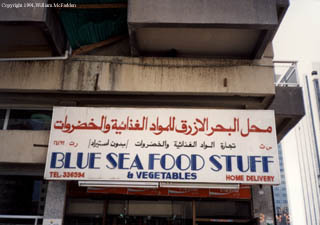 In Jeddah, our people lived at several locations. 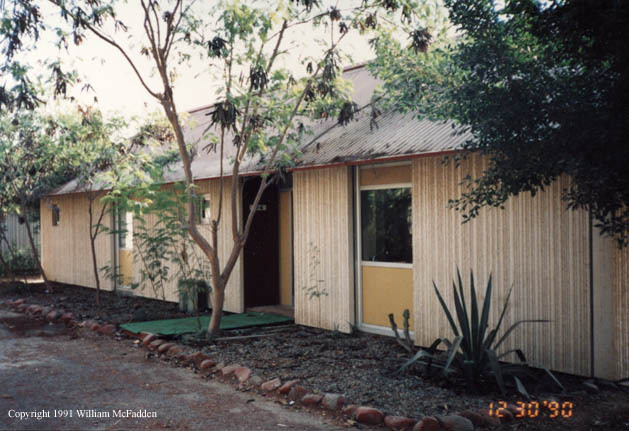 Most of the operations staff personnel, including me, lived at "Lockheed Compound", which had been constructed for the Lockheed Aircraft employees who maintained the Saudi Air Force C-130 cargo airplanes. 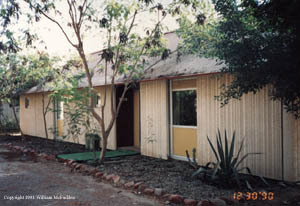 At Lockheed Compound we lived in small houses that we affectionately called "hooches". These were constructed of poured concrete. Unfortunately, Lockheed was directly off the end of the runway of Jeddah-New Airport, and was often noisy. In addition, the groundskeepers at Lockheed irrigated the lush greenery with water that smelled of sewage. 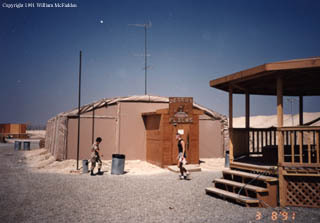 The Compound had a small store, a rec-room, a pool, and a chow hall. The chow hall was operated by Filipino people. The food was acceptable, but certainly not world class. Breakfast usually consisted of runny scrambled eggs, beef sausage, french toast, and pancakes, all served off a steam table. Pork of any sort is forbidden in Saudi, so bacon was never available. Dinner usually consisted of rice and two meat choices, of which one was usually chicken. For some reason, one of the Filipino gals behind the steam table learned my name, and greeted me cheerfully every day. She was quite cute. Upon our arrival at Jeddah, we were given a briefing about the Saudis and their customs. We were told not to photograph anything outside of our housing compounds, as air defense sites were everywhere and illegal to photograph. In addition, it was forbidden to photograph a mosque. We were told that if a policeman caught us photographing, he would take away our camera. 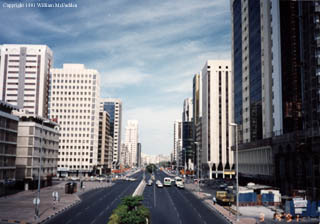 For this reason, and because the Saudi system seemed intolerant of non-Arabs, I was hesitant to visit downtown Jeddah. However, I did visit it once. I was not terribly impressed by the city itself, but the Corniche Mall had many nice shops, and I got to see many Arabs and immigrant workers. I also noticed the drivers on the highway. (These were all male, of course!) They all seemed to pay absolutely no heed to the lines painted on the roads. In fact, it seemed that all drivers took racing lines through all the turns. In addition, as a light changed from red to green, if a car up front did not move immediately, the cars behind honked their horns. In fact, our taxi driver actually bumped the car in front after two honks in three seconds did not prompt a reaction! At Jeddah-New Airport was the Haj, which is the large fiberglass tent-like structure where the pilgrims stay on their trek to Mecca. These were designed in Granville, Ohio, by Owens-Corning. Of course, photographing the Haj is illegal, but I managed to shoot it from the open cargo door of our airplane as we prepared to depart for UAE. 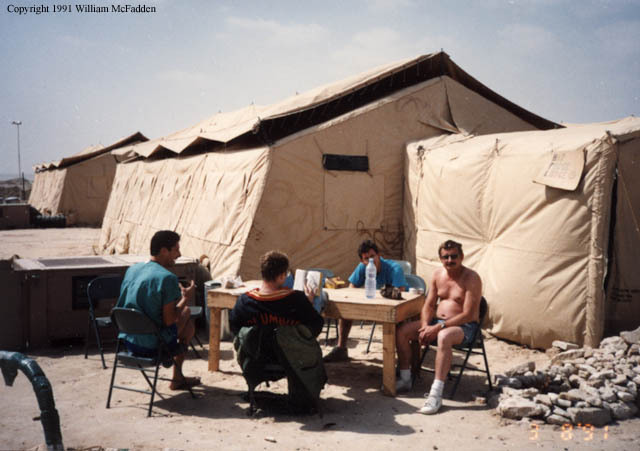 Some of our maintenance personnel lived in the Haj while in Jeddah. From Jeddah we flew to Abu Dhabi, United Arab Emirates. In UAE we lived at Al Dhafra Air Base, which also housed another American tanker unit, two American F16 units (approximately 100 aircraft), an Italian Mirage-2000 unit, and an Emirates Tornado unit. 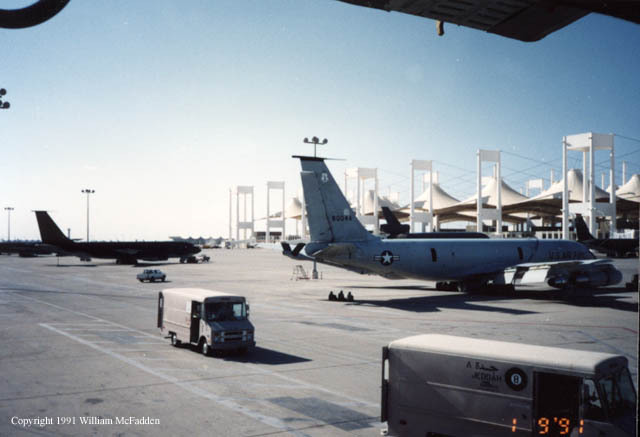 Our airplanes were stationed not at Al Dhafra but at the Abu Dhabi International Airport, and the 160th was combined with the 126th AREFW, Illinois Air Guard, out of Chicago, forming the 1712th Provisional Air Refueling Wing. 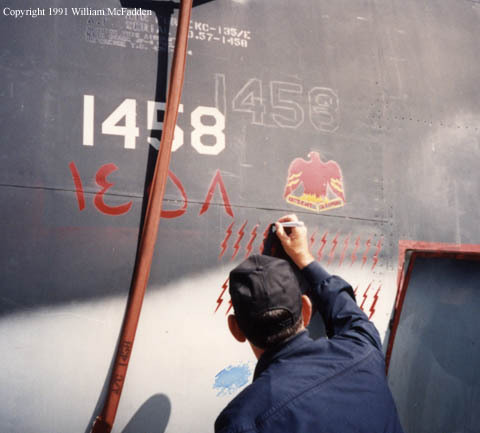 The 1712th was part of the newly-formed 17th Air Division, which consisted of all the Strategic Air Command (SAC) personnel and aircraft serving in-theater. To get to the International Airport from Al Dhafra, we rode in buses for half an hour. As the Emirates were sensitive to our presence at the airport, we were required to work in civilian clothes. The 1712th had a total of sixteen tankers at the airport. During the height of the air war, we were flying about eighteen missions each twenty-four hours. The terrain in Abu Dhabi was truly desert. The sand was extremely fine, and if the wind kicked up, it was impossible to avoid sand in the eyes and mouth. 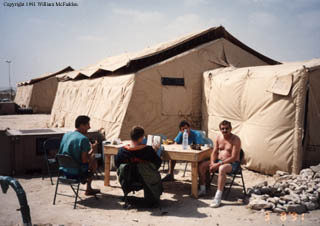 At Al Dhafra, we lived in large, ten person tents. These tents had outboard air-conditioning/heating units, which were nearly indispensable, as the daytime temperatures reached the middle eighties, and the overnight temperatures dipped to the forties several nights. I was told by others who were at Al Dhafra during August, 1990, that the daytime highs climbed to a staggering 130 degrees! We were required to build plywood floors and sandbag bunkers for our tents. Some of my tent-mates built wooden shelves or lockers in their spare time, but I contented myself with cardboard furniture. We were given aluminum/nylon cots and foam mattresses; this combination was extremely uncomfortable until we cut plywood to place between the cot and mattress. We also had sheets, pillows, and the standard issue gray wool blanket. 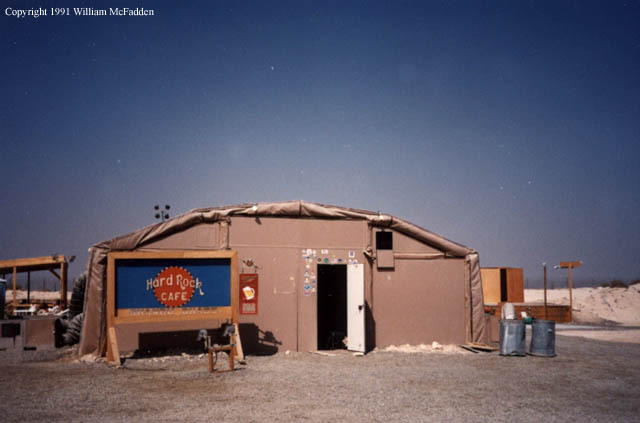 The F16 people provided all the services for the so called "tent city" at Al Dhafra. These services included Civil Engineering, Food, and Laundry. In addition, a small Tactical Field Exchange (BX), NCO Club, Officers' Club, Theater, Library, Gym, and USO were provided. While it wasn't excellent, the food was acceptable, and abundant. Typical fare included rice or potatoes, a chicken dish, a beef or pork dish, sometimes fish--we were there for Lent, after all!--and two vegetables; in addition cake and ice cream were usually available. The most memorable meal was provided on the second day of the air war, and consisted of steak and lobster, corn on the cob, and mashed potatoes. Beverages included the standard Coca-Cola products, ice tea, and water. I drank water. The laundry service was not something to write home about. On Tuesday and Friday evenings we collected our dirties, which we turned in at the laundry. We retrieved them the following morning, often damp, and always slightly more gray, but otherwise clean and sand-free. 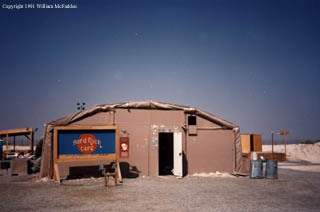 The NCO Club, the Hard Rock Cafe Shawbu Dhabi, was built inside a semi-hard shelter, a variation of the ubiquitous quonset hut. (All the services previously described were in tents, although sometimes these were large.) The NCO Club offered pool tables and dart boards, couches, a TV for CNN, tables, and a bar that served several brands of beer and wine coolers. We were provided a "Beer Card" which entitled us to purchase two beers or wine coolers per day. The beers were $1.00 each, and the coolers were $1.25 each, although there were occasions when beer and coolers were available at half-price. Often, the bartenders forgot to mark off the beer card, so the two drink limit was not much of a problem for those who would otherwise be bothered by a limit. (A dollar tip seemed to guarantee this type of memory failure.) The Club was flawed by two problems: The music was extremely loud, and the air was very smoky. Despite these problems, the club was usually crowded. I have no personal experience of the Officers� Club, as I am an NCO. Talking to officers and eavesdropping, allowed me to glean the following information. The officers were not limited to two drinks as enlisted nominally were. In fact, an officer could purchase beer by the case, ostensibly to pay the Civil Engineers for services rendered, i.e., floor or deck construction. In addition, the music wasn't so loud, nor the air so smoky. However, it was the turf of the fighter jocks, and some heated arguments occurred with these pilots and our tanker aircrews. Initially these arguments centered on the presence in the club of our boom operators, who are enlisted, but due to crew-integrity requirements were expected to enter the O-Club with their crew. Later the gripes from the fighter jocks turned to all those in the club who hadn't flown above twenty-nine degrees North, the Iraqi and Kuwaiti border with Saudi Arabia. This attitude upset several of our crew members and non-flying officers. I don't believe this animosity was resolved prior to our departure from UAE. The theater was another quasi-quonset hut. Inside was a popcorn machine, chairs, a projection TV, and a reasonable audio system. The TV signal was provided by a VCR in the Morale-Welfare-Recreation (MWR) tent next door. Movies were scheduled a week in advance. I watched Ghost, The Money Pit, Memphis Belle, The Princess Bride, The Breakfast Club, and Joe versus the Volcano, among others. I learned that the 1300 showing was not enjoyable due to the noise of the F16s taking off. The library was a tent filled with shelves of books, mostly paperback, and a reading room. The books were free for the taking on the honor system. I don't know where these books came from, but it was clear all were used, so they may have come from care packages. I read several books from the library. The "Sand-Blasters Gym" was in another quasi-quonset hut. It contained free-weights and loud rap music. The USO was in a tent, and contained primarily a large TV for watching CNN. In addition, there were rooms with VCRs and cameras for filming messages to send home. For this, the USO provided free videotapes. The aircrews and some of the staff eventually were able to move from their tents to small hooches. The reasoning was that the crews could sleep better in the hooches than in tents. These hooches were like small trailers, but without wheels. Near these hooches was the tent-city swimming pool, a favorite of almost everyone. On any sunny day, the chaise lounge chairs would be filled with sun-worshippers, and the smell of coconut would permeate the air. I didn't visit the pool often, as I am not a sun-worshipper. On my days off I read books, listened to my shortwave radio, or visited the theater. I found many interesting and exotic stations on my shortwave radio, a Sangean ATS-803A and a simple dipole antenna, but as the war progressed, I settled on the BBC for their award-winning news coverage. I came to use the BBC as my primary news source, as I disliked the fashion in which CNN presented the news, particularly their continual parade of "Middle-East Experts" second-guessing the Allied Commanders. The Crew Comm Shop consisted of myself and three Chicago persons. These were Ernie Hayes (the boss), Greg Woods, and Renata Sellars. We worked one person per twelve-hour shift. Initially, we worked two periods on, two off. Ernie and I started working the day shifts. On the fifth of February, Greg was sent to Riyadh to work at the Crew Comm Shop there. At this point the remaining three of us started working four periods on, two off, but we alternated periods of day shift with periods of night shift. This was hard on my system. When Greg returned, we resumed the previous schedule. While Greg was at Riyadh, he was the ranking person in the crew comm shop. He was a Sergeant. This was CENTAF headquarters, and supported about sixty KC-135 tankers. He counted the SCUD attacks with marks on his steel-pot helmet. Food at the airport was really very good. 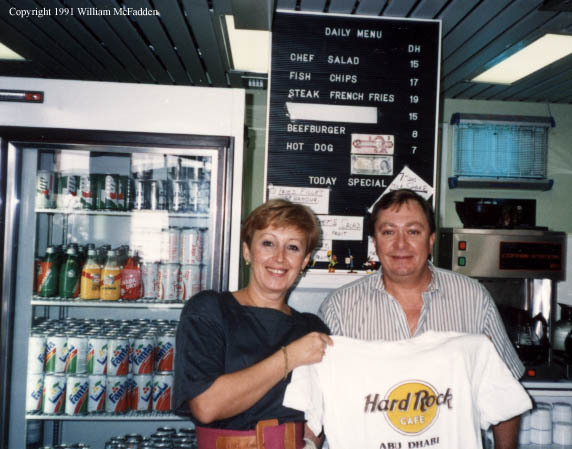 At the Emirates Air Service terminal (EAS owned the building we were in, too) was a small restaurant, run by Mila and Swen, who were Czechoslovakian. The menu here consisted of four specials. One was always a curry, either beef, chicken, or veal. These curry dishes were quite spicy. Another special was hamburger or hotdog and french fries. Mila's fries were extraordinarily good. The other specials were usually European recipes, and delicious. For the aircrews, box lunches from the airline caterers were provided. These included chicken, small submarine sandwich, and shrimp salad sandwich. Night-shift operations personnel were provided hot box lunches from the caterers as well. The food in these box lunches also were not traditional Arab food, but western. The Emirates monetary unit was the dirham. At the time of our visit, one dirham was worth about twenty-seven cents. The smallest denomination paper bill was a five dirham note. Coins were used for a single dirham, a half dirham (50 fils), and for a quarter dirham (25 fils). The bills contained a water mark of a falcon. As we were not initially allowed to go to the city of Abu Dhabi, it was arranged that we could shop at the Abu Dhabi Duty Free at the airport. The Duty Free was run solely by Filipinos, mostly women. It was a large establishment, containing two electronics stores, a tape and CD store, a perfume store, a jewelry store, a leather store, a deli, a bookstore, a toystore, and a gift shop. The tape store sold "bootleg" tapes at eight dirhams ($2.25) each. These tapes were legal in UAE as there are no applicable copyright laws. We were finally allowed to visit downtown Abu Dhabi after the war ended. It turned out to be a spectacularly beautiful city. It is right on the Persian Gulf, and much of the architecture is new and quite striking. One could find thousands of small shops, called souks, selling all manner of goods, including foodstuffs, jewelry, clothing, toys, electronics, books, religious articles, smoking paraphernalia, and cooking utensils. Mosques were seemingly on every street corner. Of course, non-Muslims are forbidden to enter a mosque, and photography of mosques is forbidden. The Corniche Road, which ran around the city at the Gulf, contained several beautiful fountains and a clock tower. Downtown we saw Hardees, Pizza Hut, and Burger Queen restaurants, as well as several of the major hotel chains (Marriott, Holiday Inn, etc.) Unlike at Jeddah, non-Arab women were allowed to dress as they pleased, and we saw several women wearing western garb. We even saw some women driving cars. It was apparent that the Emirates are much more tolerant than the Saudis. After the end of the war, the Operations Section threw a party at the "British Club", which turned out to be a small boating club. The club was located right on the water, and had a dozen or so small racing-style sailboats. The feast provided for our party consisted of grilled chicken, ribs, and burgers (but no buns), and alcohol. Very near the club was the U.S. Naval Port. Several of us left the party to explore, and were rewarded with tours of the USS Shreveport, a landing vehicle ship, and the USS Leader, a mine sweeper. The Shreveport was carrying a detachment of Marines with Cobra attack helicopters, and was large. The Leader was of all wood construction, and was small. I was impressed by the friendliness of the sailors I met, and their willingness to provide us with the detailed tours. They also seemed to be interested in what we could tell them of the Air Force and KC-135s, and of our part in the war. General Caruana was the commander of the 17th Air Division. On the fourth of March he visited each of the sites, in turn, to give each unit a rousing "Thank you�you did a great job" speech, and to dispel any unfounded rumors. He showed us a videotape illustrating the accuracy of the bombing techniques, so we would be confident that all measures had been taken to protect the Iraqi civilians from harm. He was unable, or unwilling, to provide us with a go-home date. He only told us that he�d send us home as soon as possible, as he could go home only after the last SAC forces left the theater. He also could not tell us whether we were to proceed directly home, or re-deploy to another location. During the following week all wood in the tents was pulled out. 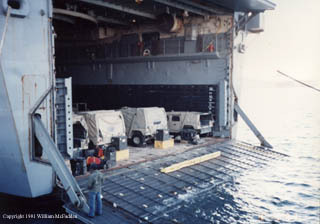 This included the floors, furniture, and decks. We were told to be prepared to drop the tent on the day we left. On Sunday, 10 March, we learned that our people and aircraft were to fly home over the following three days. The entire Crew Comm section except Greg was to fly out on the first day. We got busy packing up the office and building comm kits for the missions flying home. Somewhere over the Atlantic, we rendezvoused with another of our Adu Dhabi birds, and one from Dubai. 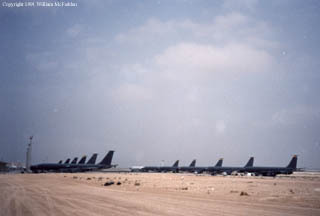 (Six 160th airplanes had been stationed at Abu Dhabi, the remaining four at Dubai, UAB.) Nine hours after we left Moron we were low over Columbus flying an airshow formation. Shortly thereafter we made a three-ship, low altitude pass over the runways at Rickenbacker with booms extended. (These theatrics were at the request of Governor Voinovich.) We landed at 1030 local time, and we could see the three thousand people who had come to greet us. The Base Fire Department had all the fire trucks on the ramp, lights flashing and sirens screaming. As we disembarked from the aircraft, we had to shake hands with a score of dignitaries, including Governor Voinovich, Mayor Rinehart, the Columbus city council, and several very high ranking individuals from the Ohio ANG. Governor Voinovich gave a rousing welcome-home speech, then food and beverages were provided. All the television stations in Columbus had sent reporters who were busy interviewing anyone who appeared to have an interesting tale. Gary Snyder of the Ohio University College of Osteopathic Medicine and a pair of Athens Messenger reporters were on hand to talk to and photograph me and Gary Sims, a fellow OU employee. Three 160th aircraft returned home on the twelfth of March. The remaining seven aircraft returned the following two days to find similar receptions. As we left the base, we were told not to return until called. I was called to report to Rickenbacker on the twenty-second of March. At this time I learned that now the 160th was involved in Pony Express, in which we deployed crews and aircraft overseas to move persons and cargo within and out of the war theater. For the 160th, Operation Desert Storm was a very good war. Here is a summary of the 160th's accomplishments during the six weeks of Operation Desert Storm. I was stationed "in-theater" for seventy-four days. My job was a small but important part of the total war effort. I was exposed to a new part of the world and a different culture. I worked and lived with 160th personnel under trying circumstances, and grew to know them better than before. I learned that the Air National Guard can do the job when required to. I do not regret being involved in Operation Desert Storm.